Binder Jetting, also known as full color 3D printing or Inkjet Powder Printing is an additive manufacturing process that is popular since you can have detailed 3D prints with color. An automated roller is used to spread a layer of powder onto the build platform. Excess powder is pushed to the sides and ensures that the bed is filled with a layer of packed powder. On a fast axis, the print heads apply a liquid binder and color simultaneously to create a cross section of the object on the powder. The same way an inkjet paper printer works only with this process, instead of paper, powder is the medium. The process is then repeated where the bed lowers and a layer of powder is rolled across the top and the print heads dispense liquid binder and color until the object is created. With this process, there is no need for support since the powder is self supporting. Compared to FDM/FFF, this process requires further post processing techniques such as vacuuming of the excess powder, depowdering the object using compressed air, then infiltrating the object with cyanoacrylate (super glue). 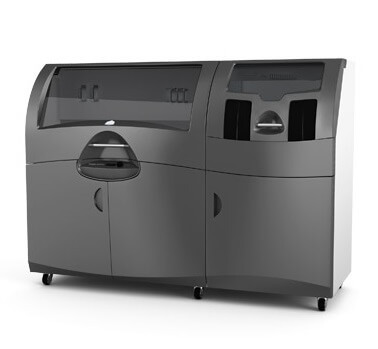 One of 4 printers in the Professional line of full/multi-color 3D printers. For more information about the 3D printers, please check out our Guide to Professional 3D Printers .